Free WiFi Spots are more convenient than a Rental Pocket WiFi? Ikebukuro rental pocket WiFi available! Rent a pocket WiFi to enjoy your visit to Ikebukuro! You would be connected as soon as you receive it at the airport. Ikebukuro is one of the biggest cities in Tokyo, located in Northern part. There is the famous observatory called Sunshine60, where you can enjoy fantastic view of Tokyo. Ikebukuro has everything - department stores and the biggest book store in Japan for shopping, famous ramen restaurants for gourmet, movie theaters and game centers for entertainment and more. There are also some anime shops in Ikebukuro. That's the reason why you should visit Ikebukuro. It's so much fun! When visiting Ikebukuro it would be very convenient if you have an Internet connection. Since there are so many fun places, you might want to look up where you chould go. The internet connection is a must-have option these days. So better to think about how you get an Interenet access in Japan. Why not get a rental pocket WiFi? How can we access to the Internet in Japan? We have three options - free internet service, rental pocket WiFi and roaming service which is normally extremely expensive. We recommend a rental pocket Wifi because it's fast and always-connected. Free WiFi spots are often hard to connect or very slow if you succeed to connect. You could not concentrate on your trip with free WiFi. With a rental pocket WiFi you wouldn't have to look for Free WiFi spots anymore and you can use it as if you were in your home country. You wouldn't get lost if you have Google maps app. It means you could find easily where the famous ramen shop is. We're sure you would enjoy your trip to Ikebukuro with a rental pocket WiFi. Stay online anywhere you go! Free WiFi available in Ikebukuro area? Like other cities free WiFi environment is quite easy to find in Ikebukuro. Free WiFi is available almost everywhere around the Ikebukuro station. Let's see where we can find free WiFi spots in Ikebukuro city. In Ikebukuro you can find "Toshima Free WiFi". Like other major cities public free WiFi service is available here in Ikebukuro as well. Usage time is quite limited, you have to reconnect in every 60 minutes. In addition to that, you would need your email address to be registered. better not send or recieve your personal info. Skycircus is an observatory at the top of the Sunshine60 building. 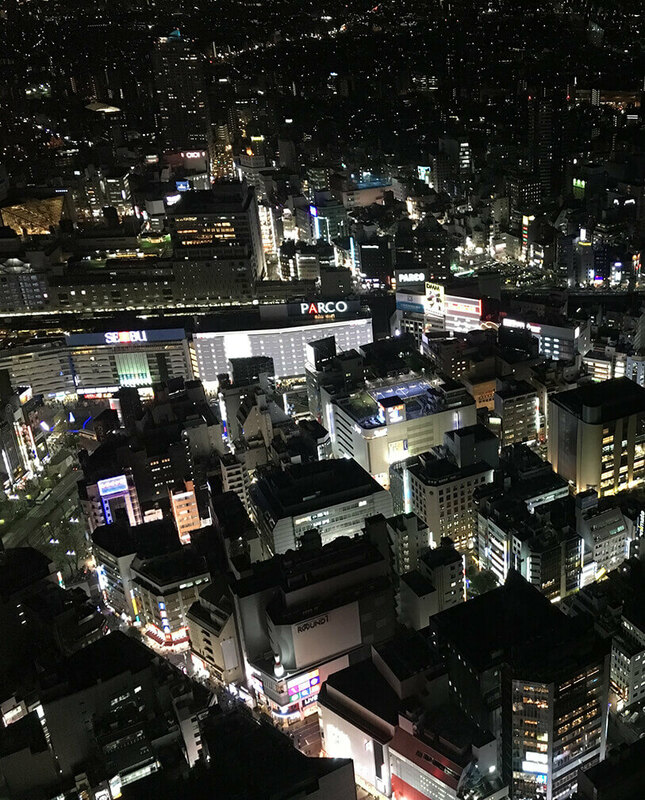 You would enjoy the view of Tokyo especially at night - night view is really nice! If you take a picture you want to share it. Since Skycircus offers free WiFi you can share it as soon as you get a picture with your smartphone. However, sometimes it's not available. The connection is not stable unfortunately. doesn't seem to be stable. Bic Camera is one of the most famous electronics stores in Tokyo area, whose headquater is here at Ikebukuro. So the biggest electronics department store of Bic Camera is in front of Ikebukuro Station. Since Bic Camera offers free WiFi as well as other electronics store you can check the lowest price at the same time. And you would find they often offer the lowest prices. Getting out the big and complexed Ikebukuro station, you might find a familier logo in yellow. You can find McDonlad everywhere in the world and Ikebukuro is not and exceptional. And they offer free WiFi as well. Usage time is limited up to 60 minutes. "Matsumoto Kiyoshi" is one of the most famous drug stores in Japan. Especially in major cities you can easily find them. They offers their own free WiFi for their customer. Since you can use it without any registration it's easy to connect. However the connection is not secured. So you need to be careful for your data communication. Free WiFi spots are getting more and more popular. However still there are security problem and speed problem. It might be OK if you use it once a day or so. But if you want to connect to the Internet whenever you want, we highly recommend a rental pocket WiFi. With a rental pocket WiFi we're sure that your trip to Ikebukuro would be more exciting!